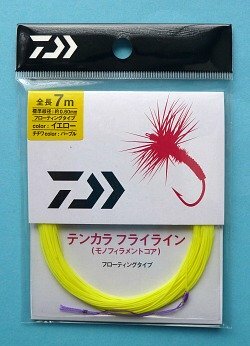 The Daiwa Tenkara Floating Line is a bright yellow PVC floating fly line that casts well and is still relatively light. It is nice for fishing panfish poppers or for breezy days. The first time I tried a floating line with a tenkara rod was several years ago. It was a .024" diameter monofilament core PVC floating shooting line. I found that it cast very well and wasn't nearly as heavy as I had expected. Still, I preferred fluorocarbon and I decided against buying the line in bulk and making up tenkara lines from it. Daiwa recently came out with a floating tenkara line (they call it Tenkara Fly Line) that is the same .024" diameter and is also a monofilamant core PVC line. The Daiwa tenkara floating line is a bright yellow so it is easier to see. It is just as light as the line I tried years ago. It casts just as well and floats just as well (and I don't have to cut it and package it myself!). The Daiwa Tenkara Floating Line comes in three lengths: 4m, 5m and 7m. The lines come with a loop for attaching to the lillian with a girth hitch. The three different length lines have different colored loops, so you can easily tell which is which when they are wrapped on Tenkara Line Holders. The 4m line has a chartreuse loop, the 5m line has a pink loop and the 7m line has a purple loop. The tippet end of the line is not finished. The back of the package suggests a nail knot to attach the tippet or a figure 8 knot in the end of line and a loop in the end of the tippet to make a girth hitch around the line (just as you use a girth hitch to attach the line to the lillian). I do prefer fluorocarbon line, so I have only fished the Daiwa tenkara floating line a couple times. Just once was enough to decide the 4m line works quite nicely with a 3.9m rod. You can just see the tip of the line at the top of the photo below. I was at the International Federation of Fly Fishers International Fair in Livingston MT. It was mostly business, but I was able to sneak off for about a half hour's fishing. The Tenryu Furaibo TF39 is designed specifically for level lines, but the 4m Daiwa Floating Tenkara line was not too heavy for it. I am sure you could also cast it with the Suntech Kurenai HM39R. For a PVC coated floating fly line it is really very light. I next tried the 7m line with a Suntech Keiryu Sawanobori 53. Although I generally fish a relatively short line with the two handed keiryu rods, the 7m Daiwa Floating Tenkara line cast magnificently with the 5.3m rod. 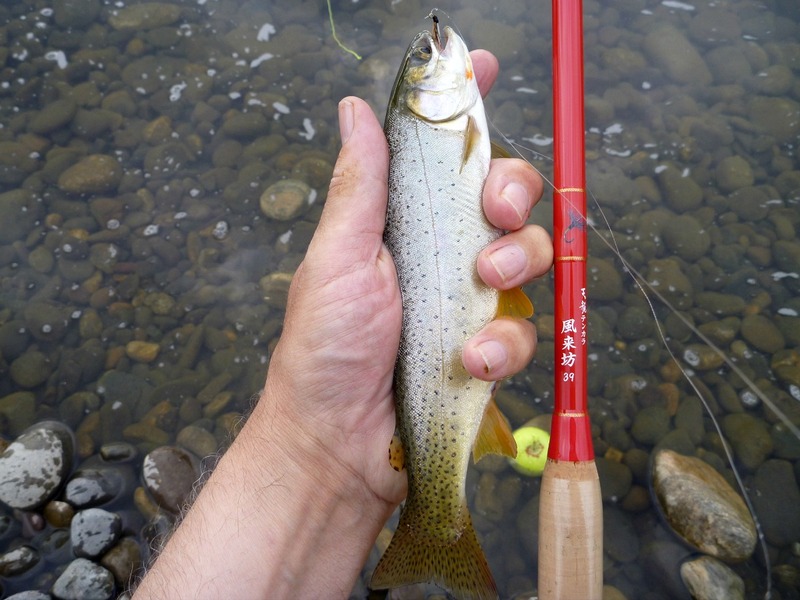 If you are fishing pocket water with lots of tricky currents, I would still recommend a shorter line, but if you are fishing a lake or a river with glassy pools or unbroken riffles, the longer floating line could work very nicely for you. If you are fishing on a breezy day (and I think ALL the days are breezy in Montana) having a floating line gives you the option of anchoring the line in the surface. You'll still have drag to contend with, and may have to review how to mend a line, but the water-induced drag might be a lot less than the wind-induced drag! I could see the Daiwa Floating Tenkara Line as being THE line to use when fishing hoppers, or hopper/droppers or panfish poppers. And, I shouldn't forget bass bugs! The line is just heavy enough to cast them nicely, and it floats so you can let the bug sit until all the ripples dissipate. Then just a twitch is often all it takes to induce a strike. Even for die hard level line fans, there are times when a floating line makes a lot of sense. The Daiwa Tenkara Floating Line is a good choice. Do not let any self styled experts (myself included) tell you that fishing a floating line "isn't tenkara." One of the most revered names in Japanese tenkara is Keigu Horie. Mr. Horie was a professional tenkara instructor. Part of tenkara's current popularity can be traced directly to him. He fished a floating line. Also, when Dr. Ishigaki organized the first tenkara Summit 10 years ago, bringing together the renowned "masters," one of them was Kazuya Shimoda. His YouTube videos (now all taken down) were some of the first I watched when I was initially trying to learn tenkara casting. He, too, fished a floating line. Put it this way, if a floating line was good enough for the masters, it's good enough to be called tenkara. The Daiwa fly line arrived last week and I had a chance to use it yesterday on a pond. Even with winds gusting to 25+ MPH I was able to use a side cast, anchor the line and most importantly catch fish. Thanks for the suggestion. It was a good one.